Call me unromantic, but I’m not a big fan of going out on Valentine’s Day. Being one of the most popular days of the year to go out, babysitters can be tough to find and most restaurants are packed! I personally think it is much more relaxing to cook a romantic dinner for two at home and have a date night in after the kids are in bed. With some planning and a few special touches, a meal at home can feel as special as a night out. And you might even have some money left to spend on gifts! I’m the first to say Mom and Dad should come first and make a regular date together a priority. I also know that the the idea of cooking and washing dishes when you already do that most nights probably doesn’t sound the most appealing. My answer is to choose very simple recipes and let the quality of the ingredients speak for themselves. 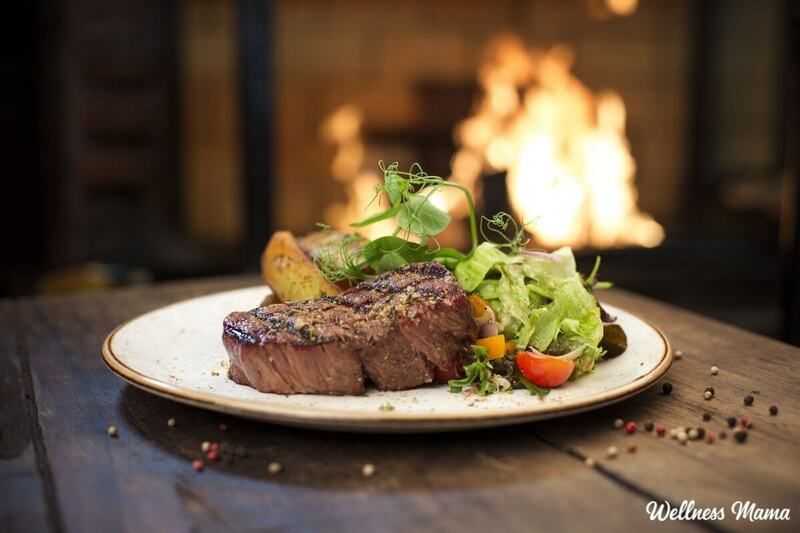 We usually opt for a simple steak dinner for the main dish and a bottle of wine. We can even watch a movie after dinner, but we get to watch it in pajamas without the smell of fake butter and MSG! 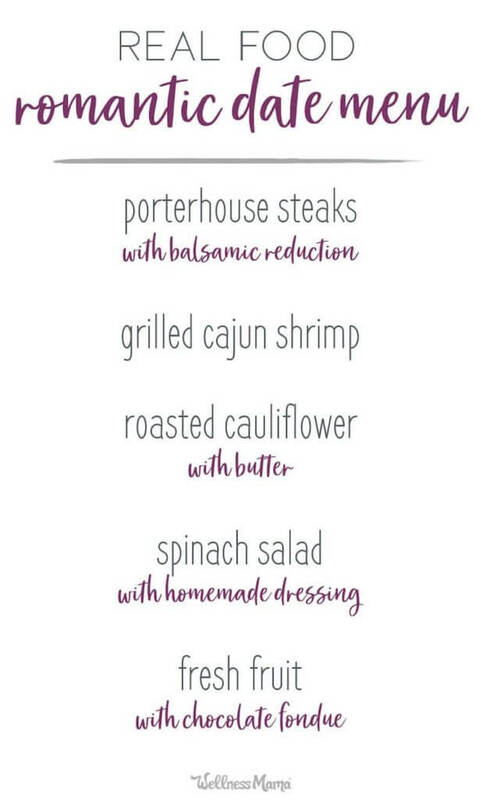 The following is our favorite menu for a special dinner on date night in. Even with premium ingredients, it is still much cheaper than eating out and going to a movie. We vary the menu a little each year, but in our opinion this delicious dinner is hard to top for deliciousness and simplicity. In fact, these are so simple they hardly even require recipes! spices of choice – garlic, salt, pepper, herbs, etc. Things you can do in advance: Set the table. Prepare salad and put into bowls with any desired vegetables or toppings and refrigerate until serving. Make salad dressing (just put ingredients for dressing into jar and shake until blended) and have ready with salad. Cut fruit and prepare on platter for fondue, keeping in refrigerator until after dinner. Cut cauliflower into large florets and coat evenly with melted butter and minced garlic, sprinkle with salt and pepper, and put into casserole dish and cover. Put in oven and bake for 20-25 minutes, stirring once. Top with cheese for last 5 minutes. Turn off oven and leave in to stay warm if finished before steak. Meanwhile, butter another casserole dish and place shrimp in a single layer. Drizzle with 4 TBSP of melted butter. Season with garlic, salt, pepper, and Cajun seasoning or cayenne. Place in oven for 8-9 minutes total, flipping once halfway through. Remove from oven when done. Once cauliflower and shrimp are in oven, season steak on both sides with a generous amount of sea salt and cracked pepper. Put onto preheated grill pan or skillet and grill 4-6 minutes. Flip and repeat on other side. Remove grill pan from heat and let steaks rest, covered loosely, for 12-15 minutes until they reach an internal temp of 130°F. Remove from pan and let rest at least another 5 minutes before serving. Once steaks have been removed from skillet or grill pan, pour balsamic vinegar onto the pan (might need low heat) and let reduce for a couple minutes to deglaze the pan. Pour pan sauce into small bowls for dipping. Put steaks onto plate, side with cauliflower and shrimp. Keep balsamic reduction on side for dipping. Serve with salads and wine or sparkling water with raspberries. After dinner, make the fondue (might need to digest a while first!) by heating heavy cream in a small pan until simmering. Turn heat off, and add chocolate bar (break into pieces as you go). Let sit 2 minutes, and whisk slowly to stir in chocolate. When chocolate is completely melted, add Amaretto or Frangelico if desired and serve with fondue forks (or regular forks) and cut fruit. Enjoy a romantic dinner with the knowledge that you are giving your love the gift of health! Over the years we’ve tried many different romantic dinner ideas, from fancy French recipes to (heart-shaped) homemade pizza. Some variety of pasta dish used to be our favorite date night meal (my husband is Italian), but when I started having to avoid a lot of grains for health reasons, we started to think about a healthier date night menu. And how about one of these desserts? Bonus: Most of the suggestions above are also one-pan or can be made in a slow cooker or Instant Pot ahead of time. Which means more time to spend with your loved one! What is your ideal romantic date? Will you try this one? Talk to me below!